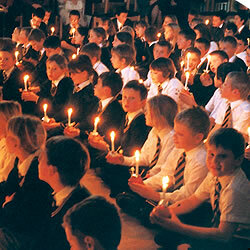 The school attaches great importance to pastoral care, discipline, manners and good citizenship. In accordance with the wishes of Sir Robert Geffery, the children are educated along the lines of Christian principles, and the school is now described as a Church of England Voluntary Aided Foundation School. There is a daily collective act of worship which all children attend. From time to time there are class assemblies, when individual classes take responsibility for the assembly. These will often show some of the work covered in the class as well as delivering a message which the other children can easily understand. These Services are open for attendance by parents and friends of every denomination or of no denomination. The school encourages understanding and respect for those from different cultures in our society.